It's the birthday of the good Doctor today, so we I thought it would be nice to celebrate with a little giveaway. 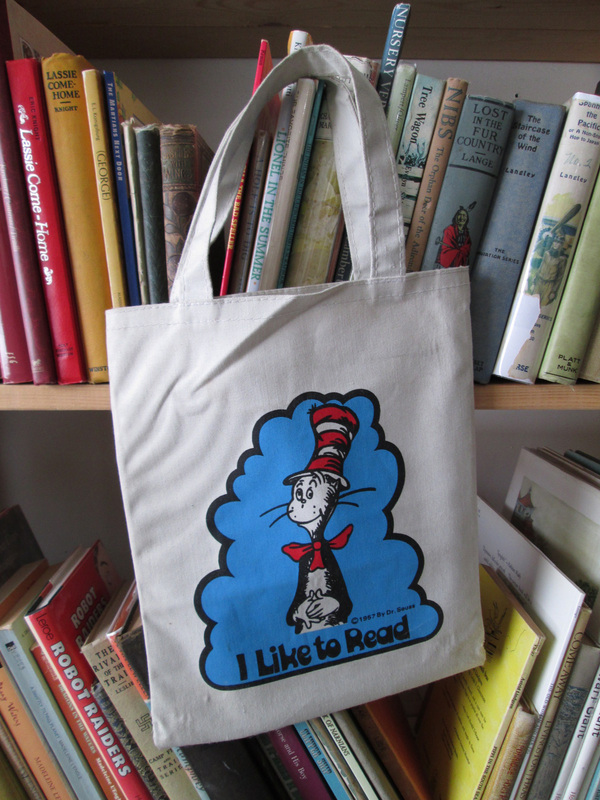 Here's a nice sturdy canvas tote bag featuring your friend and mine, The Cat in the Hat. If you'd like it, leave a comment below. You can also enter on Facebook, Twitter or by email. I will announce the winner with tomorrow's bookmark. Good luck! Its too cute! Hope to win! I <3 it! Happy birthday, Theodor!!! I would like to win this for my niece. She just had a baby girl, and I wouldlike to fill this with books for her. to carry to his reading nook. I'd love to win this bag - for ME, not for my grandchildren! I have a little bit of a tote fetish. I would love to add this one to my growing collection! Oh! I forgot it was this wonderful gentleman's birthday today! After reading his books to and then with my daughter, I have quite a few memorized, still, many years later. My (striped) hat is off to dear Dr. Seuss!